Architecture is a design or structure of a thing being built or created. It can be in the form of art, science, or business. It could include masterpieces such as a sculpture or an oddly designed art piece or a certain machinery or scientific formulas or perhaps the structure of a certain business. 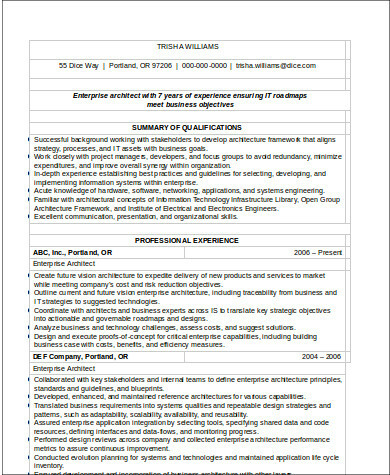 So, if you are a professional or an aspiring architect who is open to applying for a new work, then these 7+ Architecture Sample Resumes are going to give you ideas on your next draft. It is also convenient as you can also download the samples for free and can be edited too. An architect is responsible for the design construction of a certain building or structure. They are responsible for the planning of the skeletal formation and the overall design of the building. 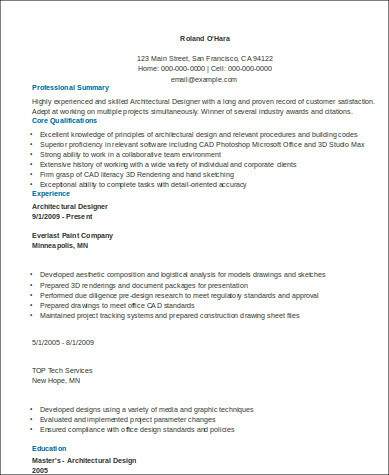 Their job is very complex and delicate, so to be an architect, one must be very aware of the social trends and correlate its awareness with its savvy design technique ideas and solid engineering skills. What Are the types of Architects and Their Roles? They are contractual designers responsible for the design structure of a certain residence. They are most likely hired privately, especially to home owners who wish to customize their homes. These are the big-time architects, responsible for the design structure of a commercial building or establishment such as a corporate buildings, school establishments, or shopping malls. These are the types of architects that focus on the inner structure of an establishment, more likely focusing on the design and functionality aspects. They are responsible for the design structure of the outdoor spaces such as public gardens, parks, residential subdivisions, campuses, or any other public spaces. An industrial architect, or others call as product designers, are the ones who designs and develops a manufactured product, not limited to automobiles, gadgets, furniture, or housewares. 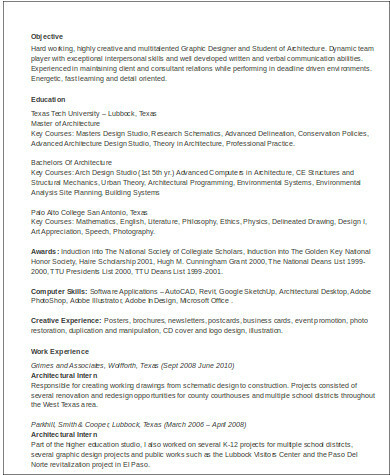 If you wanted more designer resume samples, you can also check out Designer Resume Samples or Basic Resume Samples. There are two types of architects, the professional and the interns. Their roles differ as it usually bases on the actual experiences they have. 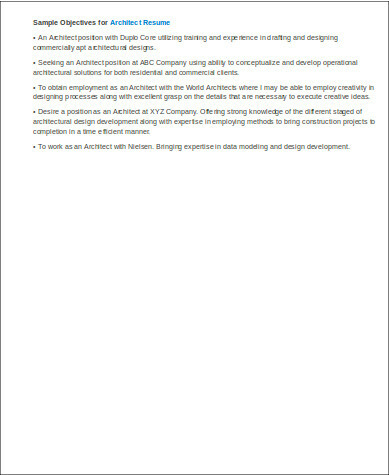 These are the experienced architects, having worked with different clients or projects over the years. They are responsible for the development and actual delivering of a certain construction project. also known as the junior architects. 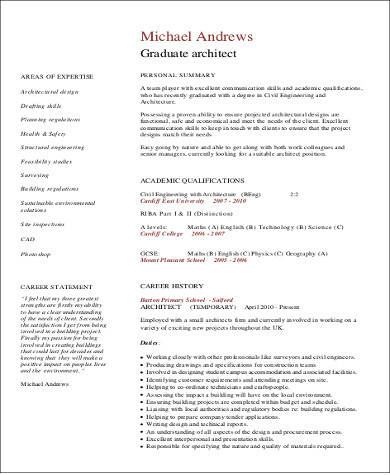 They are more likely to be working students who aspires to be a professional architect. 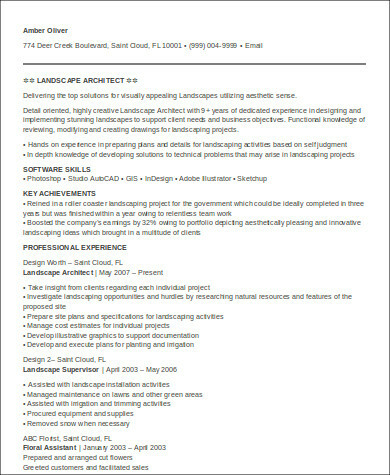 They usually start out as the senior architect’s assistant. They came in as an apprentice, learning the different work-around of the architectural industry. 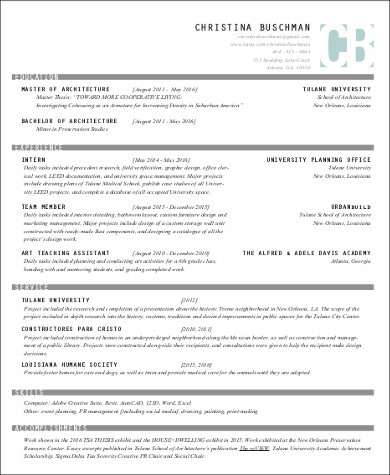 If this list does not comply with your interest, you can also check out other professional resumes such as this Professional Resume Samples. 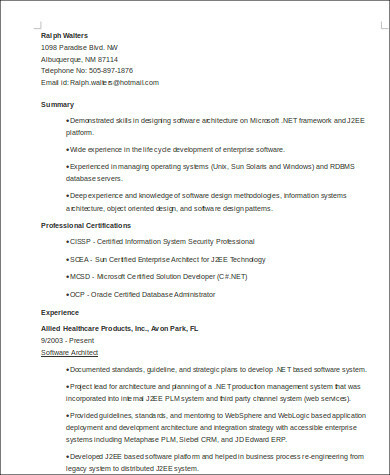 It provides different types of professional resumes samples. The files can also be used as it is free to download, as well as it can be edited.